Crossover Utility Vehicles (CUVs) have enjoyed the highest sales increase in the industry and automakers are still enlarging the category with new additions. Today, there are dozens of models available in the United States. The term "crossover" is now used interchangeably with "compact SUV," a growing segment of the family vehicle market, offering the rugged looks of an SUV with the ride, handling, stability and drivability of a sedan. In addition, crossovers with front-wheel-drive or all-wheel-drive are nimble enough to maneuver in crowded city traffic and small enough to fit into tight urban parking spaces. Any instability is overcome by electronic-stability-control packages. While SUVs typically offer lower mileage than sedans, crossovers achieve superior good gas mileage, more cargo room than sedans, and lower sticker prices. All of which make them especially attractive as family transportation. 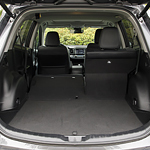 With roomier seating and storage space, they offer all of the benefits of a minivan in a much cooler package.